Events portal are a great way to earn money online. Create an events portal that lists all the events online and even sells tickets. However, Events themes are difficult to design and code. Not just that, it’s time taking too. So, you can opt for WordPress event themes instead. 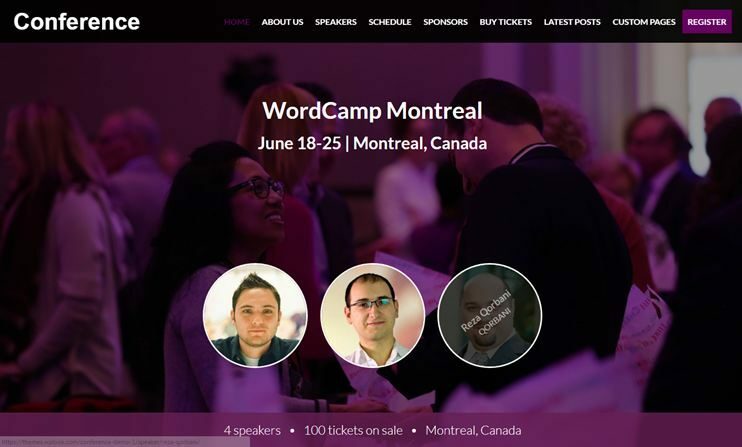 In this article, you’ll find the best events WordPress themes. When you get all the features inbuilt and purpose oriented design ready to use, all you’ll need to do is to update the theme with the actual data.These event themes are designed to let you create and display your events effortlessly with your WordPress websites. 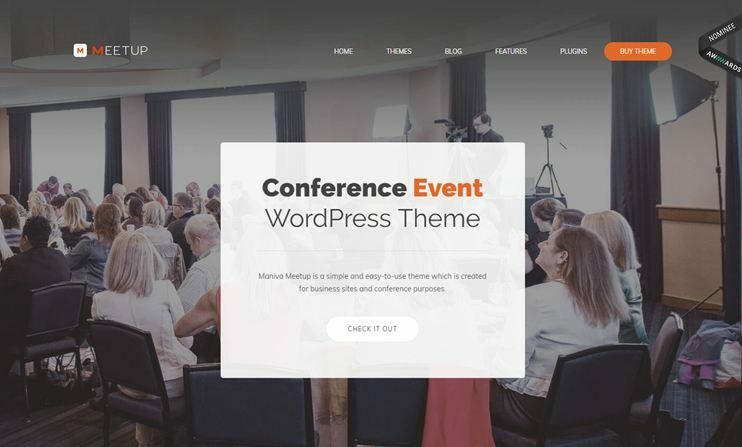 This list consists of various WordPress events themes of 2018 that you can use right away to create your event based website. Choose the theme that has all the features you want to offer with the design of your choice. 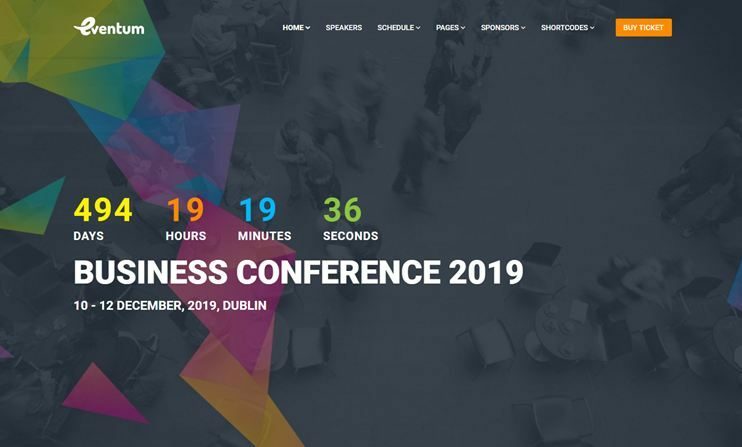 Also check our collection of best WordPress event themes and the events directory software for creating your next events directory. 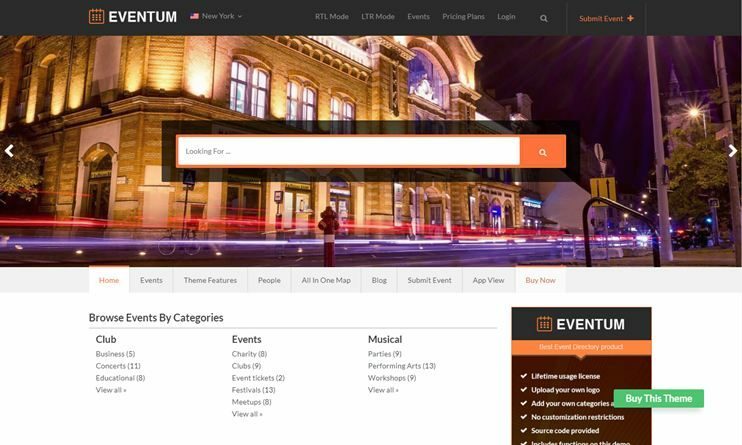 Eventum can be used if you want to create a perfect event directory website with every detail organized beautifully. Display your events like never before in 2018. It is a directory child theme from Templatic. So, you'll need to have the directory theme before you buy Eventum. Eventum is designed for displaying events on the basis of locations and categories. This theme ensures easy to search and organized content. It also lets you sell the tickets online. Eventum lets you set the custom fields for your listings. It also allows front-end event submission. 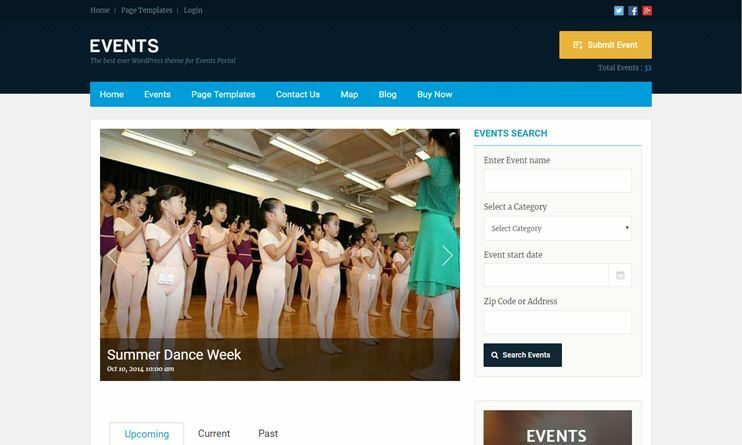 Events is one of our best event WordPress themes. The theme is extremely easy to use and customize. It has all the necessary features to let you create a comprehensive events directory. The homepage of Events theme is totally widgetized. So, change it the way you want. With Events, you can also allow front end events submission. The theme comes with well-organized event detail and event list pages. Events will also allow you to add recurring events. There's an RSVP option on the events detail page. The event location on the detail page will be shown using google maps. Moreover, events is responsive and SEO optimized. To sell tickets using events, you can use the WooCommerce plugin. 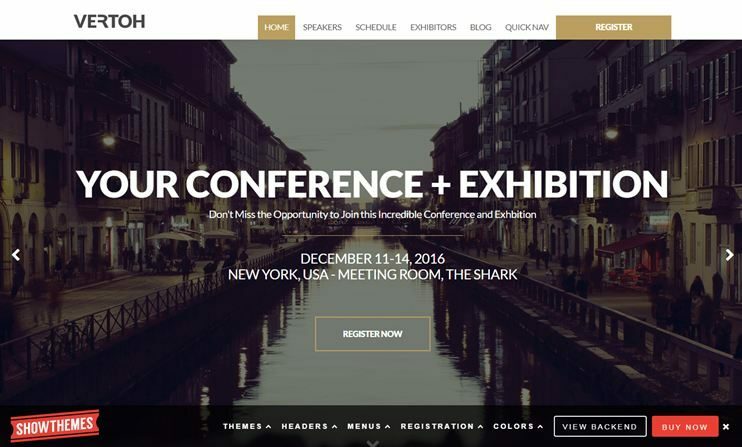 Conference from WPLook Studio is a WordPress event theme. It is suitable for creating website for events, meetings, conferences and congresses. The theme is a great platform to promote the events. The conference comes with PayPal integrated. So, sell tickets of the events or accept fees for a conference using PayPal. You can also sell the tickets using Eventbrite. It comes with a child theme template included. For advanced customizations, you can use this child theme. Conference also comes with many custom post types, designed for the theme. It also has custom widgets that you can configure and use in various widget areas. The conference is performance optimized. With the abundant theme options, you can make the theme look and work the way you want. You can also use the conference to create a multi-lingual translatable website. 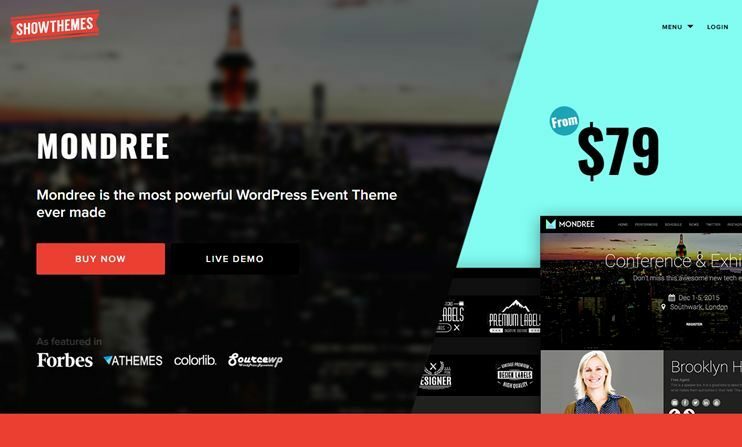 Fudge is one of the dynamic and feature-rich WordPress event themes to show the events of 2018. The theme is fully loaded with all the events related features and functions. The theme has the facility to import the events from Facebook or Eventbrite. The theme is already available in 8 languages. These languages are English, German, Dutch, Russian, Spanish, French, Italian and Portuguese. The fudge theme lets you create events in an easier way. You have an event composer. So, events can be created with drag and drop options. Fudge has maps and point of interest facility. You can sell the tickets using WooCommerce, Eventbrite, Events espresso, etouches, Xing events and ticket tailor. With Fudge, you can show a counter of who is coming to the event. It comes with all the event management facilities. Fudge also has an inbuilt scheme to allow social sharing of the events. 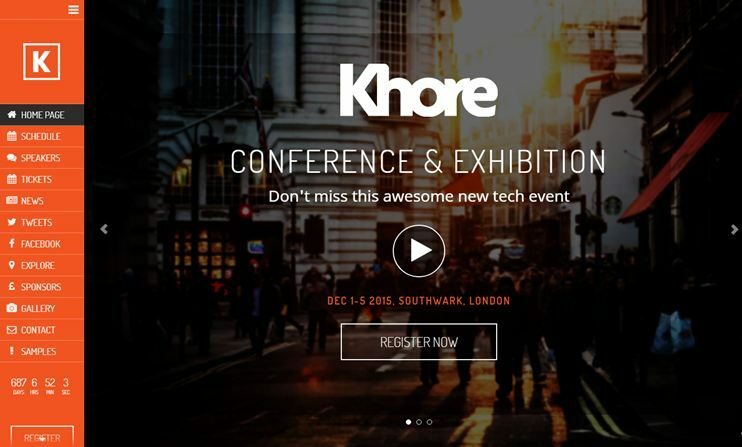 Khore is one of the best event WordPress theme for creating a full-fledged events website. It comes with an event composer. So, you can create your events pages with drag and drop options. The theme lets you integrate Eventbrite, EventEspresso, Xing Events, etouches, Ticket tailor, for selling tickets. Use the countdown timer to make it more exciting. It is already available in 8 languages. Khore comes with fb RSVP facility and social sharing ready. Khore has custom widgets and shortcodes to be used in the theme. You can start selling online using the WooCommerce plugin. Mondree is a comprehensive event WordPress theme to host your event website in 2018. 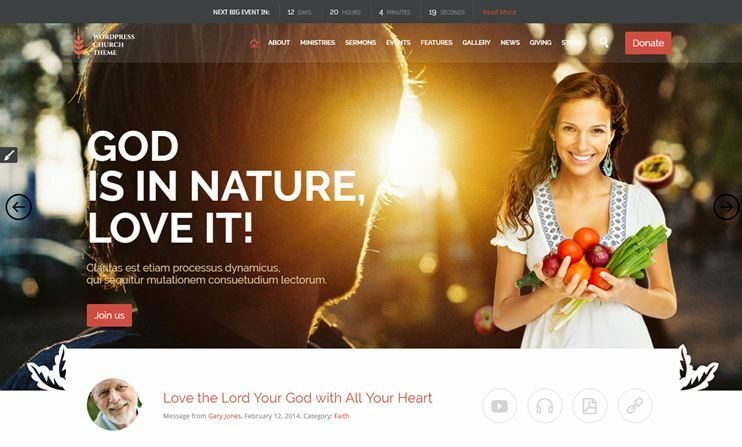 The theme has a responsive and modern design. With the abundant customization options, you can make the theme look just the way you plan. This theme allows creating events using the drag and drop events composer. The theme already is localized for 9 languages. For selling tickets on your site, you can use EventBrite, Ticket tailor, EventEspresso, Xing events, and etouches. You can show the event venues and point of interest using the google maps. Besides, there are facilities for schedule management, countdown, integrated social media, etc. For eCommerce facilities in your theme, you can use the WooCommerce plugin. Event portal is a responsive theme for creating an events website. It is flexible and easy to use. EventBuilder is compatible with Tikera and Ticket tailor. So, selling tickets using the theme is easier than ever. It also has a very comprehensive event submission form for front end submission. For creating forms, you can use the Gravity Forms, Contact Form 7, Gravity Forms. There is advertising space where you can display the advertisements. Event Builder has the support to show the events on the maps. The pricing plans can be set as per your choice. 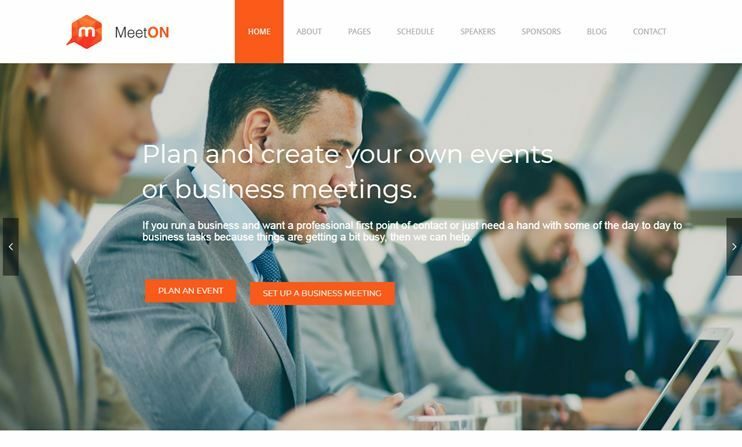 Meeton is a responsive and retina ready theme for creating a website for meetings, conference, and events. Meeton is compatible with the Visual Composer page builder. So, you can create pages using drag and drop options. With the powerful theme options, you can control the behavior of the theme. To integrate the ecommerce facilities in the theme, you can use the WooCommerce plugin. The theme also has the facilities for appointment booking, event planner, scheduler, pricing plans, etc. Event management, as the name suggests is one of the best Events WordPress themes. The theme has great features through which creating and managing events become extremely easier. Event management has the options to display the events as a grid or list on event listings page. To sell the event tickets, you can use the EventBrite. Being compatible with the Visual Composer, the theme can be used to create pages with drag and drop options. Besides, you are given abundant customization options. The theme also has the facility to show the events countdown timer. 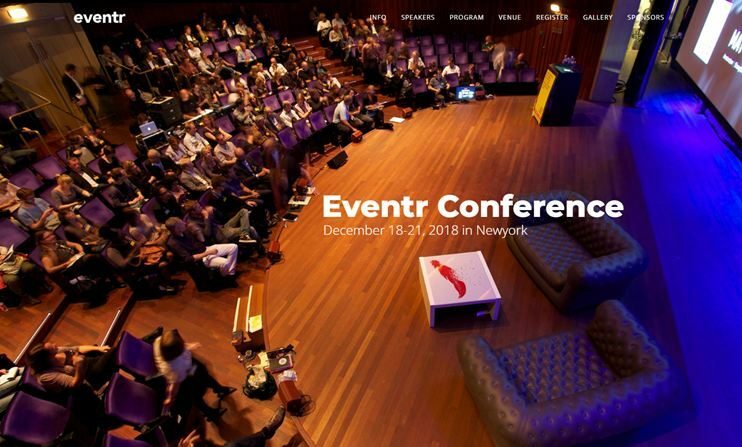 Eventra is designed for creating and managing an Events, meetup, conference, and session management websites in 2018. The theme has options to let you set beautiful sliders for your site. Eventra supports business hours pro plugin. For easy page building, the Visual composer comes included. With easy options, you can change the color and the background of the entire website. You can choose from a number of font options. The theme can be translated into the single language or multiple languages. 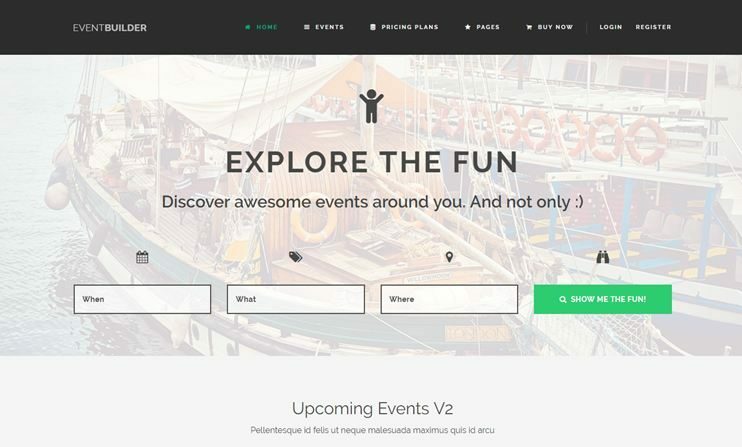 Eventum is one of the WordPress event themes with all the features required for an events portal. 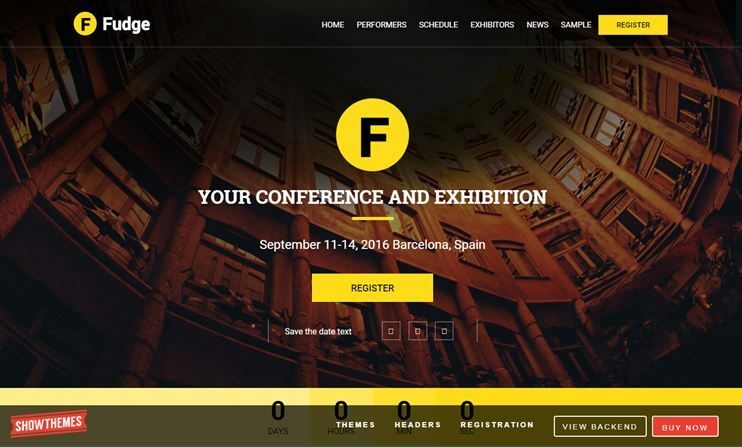 With this theme, you can create and manage events and conference website. The theme allows you to choose from the 5 homepage layouts. The theme also has the features to schedule the listings. It is also compatible with Event Espresso. To sell tickets or any commodities online, you can integrate WooCommerce plugin. For newsletter feature, you can integrate MailChimp. 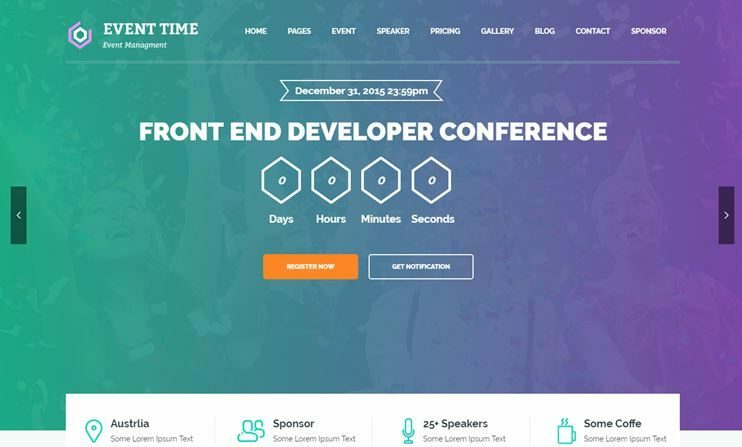 Event Time is a simple event WordPress theme. It is suitable to create a simple Events and conference website. Using this theme, you can create and display the events. This event planner WordPress theme comes with easy customization options. It has a responsive and modern design. 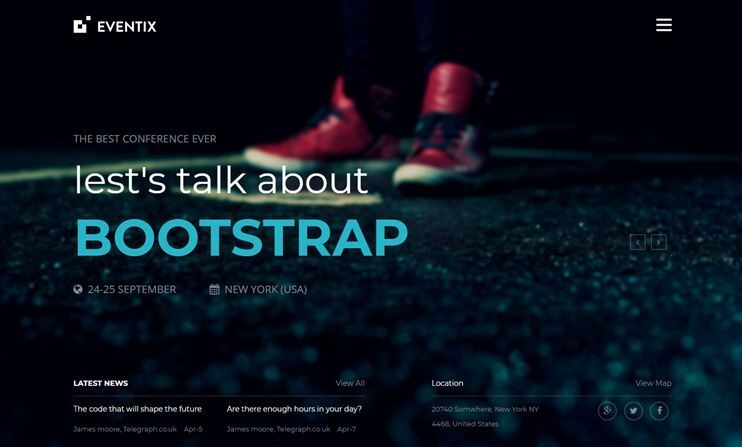 To make it more attractive, the theme has wonderful parallax background support. The theme has a comprehensive and detailed homepage. It has options for pricing plans, event scheduler, Appointment forms, etc. Goal Club is a sports events website template. The theme has all the features to let you create, manage and display sports events for any sports like football, tennis, basketball, hockey, etc. The theme has features using which you can manage the team. It is compatible with WooCommerce. So, your sports events website can also be used to sell the sports equipment. The result management section will allow you to create and manage the results of all the teams added. You can also maintain a points table using the theme. With the advanced page builder available in the theme, you can organize pages with drag and drop options. Eventix is a bootstrap 3 based event management WordPress theme. It is a landing page theme to create an events website. You can choose from the available layout variations. With the Visual Composer, you can create and manage page layouts very easily. It is a lightweight theme that loads instantly. The theme allows MailChimp integration for newsletter facility. The event management feature of the theme is supported by the events calendar. So, you can create and manage events and list them on the calendar for easy access by the visitors. 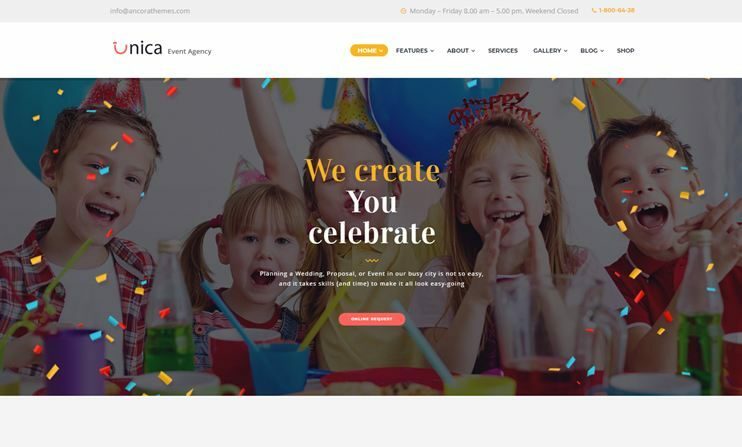 Unica is one of the best event planner WordPress themes of 2018. The theme comes with 4 premade demos. These demos can let you create Event planning, Social event planning, Wedding or corporate events website. The event planning website template has a design based on its purpose. It is responsive and retina ready. It is optimized to work well in mobile devices. You can change or manage the page layouts using the Visual Composer. It has unlimited customization options. For advanced customization, the theme has custom widgets, shortcodes, and a shortcode builder. 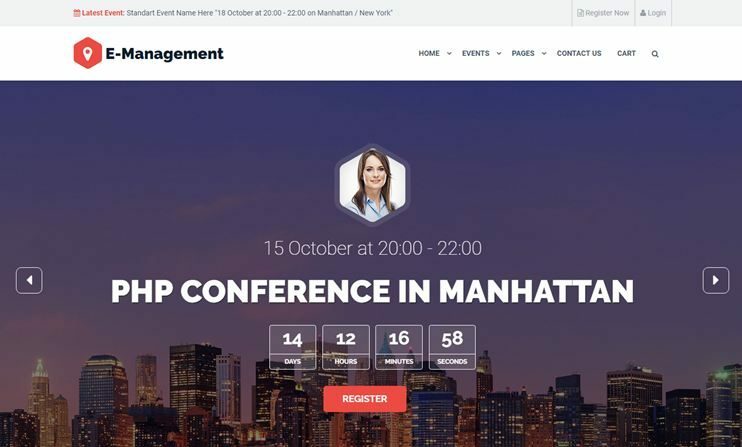 Meetup is a WordPress theme for conference and events. It supports a beautiful slider with image or video headers to create an interactive website. Meetup allows you to use Tickera for ticket selling on your Meetup website. Visual composer comes in-bundled with the theme, so you can create and manage pages using drag and drop options. With the powerful theme options, you can completely change the appearance of the theme. The theme also has a portfolio option, to creatively showcase your work on your website. 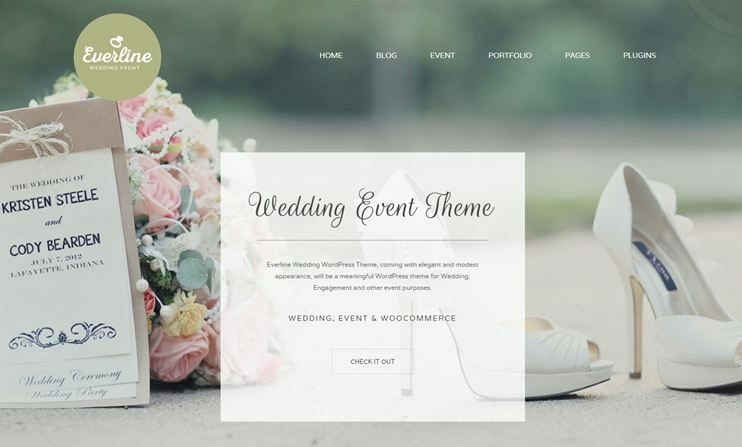 Everline is a theme for creating an events website related to wedding, engagement or related events. The theme can also be used for other purposes. You have 5 homepage variations to choose from. The theme allows the integration of Events Calendar for managing the events. Compatibility with the Visual Composer allows to create and manage pages with drag and drop options. You can also create a website in RTL orientation using this theme. The theme also allows you to manage the guest list using the Gwolle-GB. MiEvent is a one page music event theme. The theme can be used to create a website for conferences and music events. MiEvent is perfect for creating a website for events, conferences, workshops, festivals, exhibitions and music concerts. You can select from the 20 demos and decide how you want your site to look. Moreover there are numerous customization options in the admin panel. For further customizations, the theme comes with flexible and intuitive shortcodes. It has the feature to create and manage schedules. MiEvent is a modern theme with responsive and trendy design. 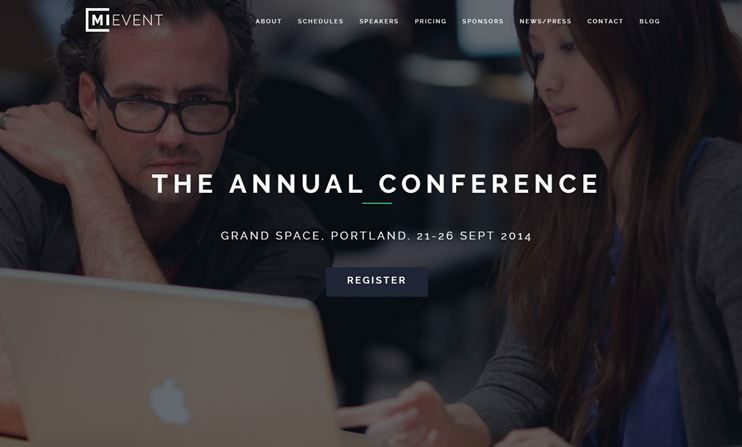 Vertoh is a WordPress theme for conference and events. You can create a full-fledged event management website, that manages, speakers, events, schedules and also sells the tickets online. Vertoh allows you to create multiple tickets and set price for them. It is already available in 8 languages. It supports eventbrite, Event Espresso, Xing events. The website can be made more interesting using the events countdown. You can choose from the 15 color combinations. 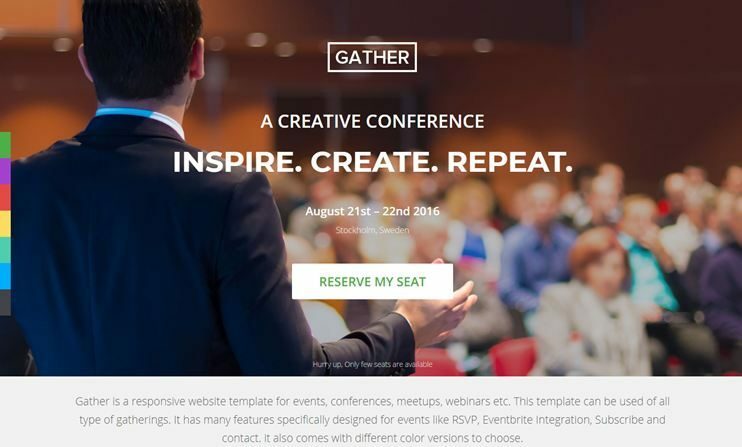 Gather is a landing page events WordPress theme. You can create a website that displays comprehensive image details using this theme. Gather comes with an event countdown widget to make the things more interesting. It has sections for managing the speakers and organizers. It shows the schedules with a vertical timeline. The theme also allows you to post and display pictures using beautiful galleries. There's also the feature to manage pricing tables in the theme. Gather also allows integration of Eventbrite. There are abundant customizations options in the theme's admin panel. For further customization, you can use the included child theme template. Eventr is a onepage event WordPress theme. The theme has a number of customization options. The theme can be used to create a website for events, conferences, meetups, etc. Eventr comes with Visual composer included. So create pages with drag and drop options. The theme is beautifully designed. 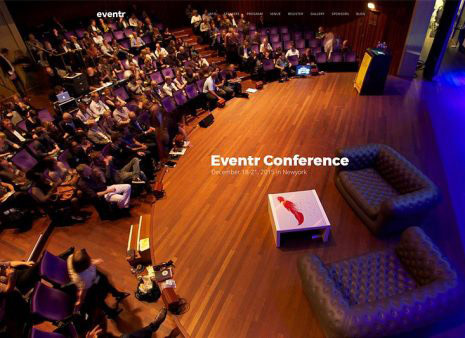 Eventr is responsive and retina ready. It comes with special post types for speakers, schedule and testimonials. Church and events is a church and event ticketing WordPress themes. The theme is ideal for creating a church website and displaying the events on the website. The theme has compatibility with a wide range of plugins. It is compatible with the WooTickets plugin for selling and managing tickets. You have various choices for the header and home layouts. With the comprehensive admin panel, the theme has unlimited opportunities to customize the theme. You can completely transfer the theme and make it work for your purpose easily. Church and events is performance optimized. It is SEO optimized and translation ready. Creating and managing an events website is a bit difficult and time consuming. But it gets easier with these themes. So, here's a little effort from us to make it easy for you to find an event based theme. With the events theme you get pre-designed and feature based templates to start with. If you ever get stuck while creating your website, the theme providers offer professional support too. With all the features and customization opportunities provided by these themes, creating an events website becomes a lot easier. So, choose a theme and get yourself an events website now.